This post racked up 1,900 Likes, but just a few of them came from the Global Voices Facebook page. Where did they all come from? 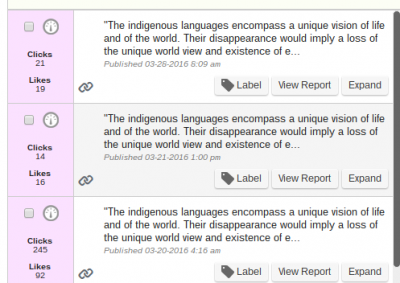 As mentioned in a previous post, Facebook plays a key role in generating an audience for articles posted on the Global Voices site. Every time someone shares one of our articles on Facebook it's exciting because we can reach so many more people and potential visitors to the Global Voices site. About 35% of Global Voices visitors come to use from social media; 75% of that 35% slice of the pie comes from Facebook; 20% of social media referrals come to us from Twitter. So social media is an important part of engaging with our audience. Facebook is great, in that a simple share can help reach an incredibly large audience. For example, this post was shared 41 times on Facebook. According to Facebook, the post reached 19,545 people. Thanks to this one Facebook post, 225 people clicked on the link to the article and came to the site. 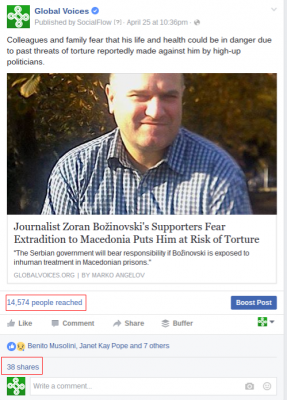 This post about Macedonia also did well on Facebook thanks to shares. While there were not quite as many shares, as the previous example, and less reach, this particular post generated 435 clicks. This high level of engagement is exciting and rewarding, not only for the social media team, but also for our writers—we all like it when people read what we write. I asked Filip about how he encourages members of the Macedonian community to share the articles. I use a combination of approaches. First, I share myself in whatever context I can. 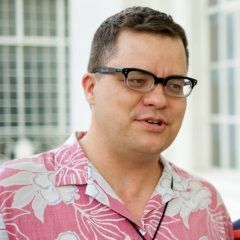 Then I try to find people who would care about the topic of the article and tell them that if they share it will help them get wider visibility for their cause. Macedonia is pretty isolated media-wise and I tell them that to break that isolation, GV is a key factor… as it is open for that kind of input. The sad thing is that in Macedonia, even putting a “like” on Facebook is an act of courage. There's evidence that the government is monitoring how people behave on social networks, and then pressures the people it can influence. For instance, the wiretaps show that even ministers discuss threatening state employees (with loss of job or degradation) who have put “like” on contents by opposition candidate at elections. It's important to note that, while making an effort to share our stories on Facebook helps, there are many times when the story hits a chord and takes flight on its own. 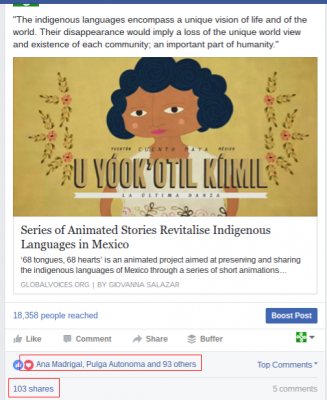 For example, Eddie Avila noticed the Rising Voices story “Series of Animated Stories Revitalise Indigenous Languages in Mexico” has been Liked 1,900 times on Facebook. What's interesting is that, back in March, the original Facebook post itself had only been “liked” about 90 times… where were all the Likes coming from? So once again, where were all these Likes coming from? We used Google Analytics to take a look at the performance of that particular post. We discovered there were about 1,200 people who had clicked on the link to the story from someplace on Facebook (note: it's generally pretty difficult to determine where an article has been shared on Facebook; here's what I could find). When reading the story they had obviously liked it, contributing to the 1,900 Likes. The interesting thing is, if you compare the Google Analytics data with the basic information provided by SocialFlow (see the above screenshots), it seems 1,000 FB referrals came from people/pages OTHER than the Global Voices Facebook page. It was a popular post. 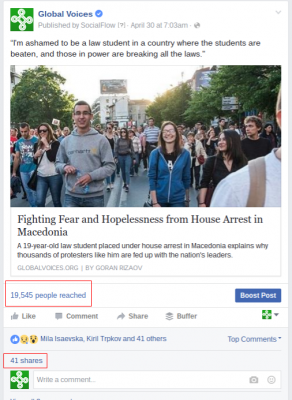 So, while Filip's stories about Macedonia resonated with his particular audience and community of readers, who then read and shared the articles themselves, other times an article will go viral and get shared a tone of times with little direct help from anyone on the Global Voices team. What's interesting is how important the Global Voices Facebook page has become when it comes to engaging our readers. We hope you'll keep visiting the Global Voices Facebook page, and if you see a story you like, will share it with your own friends. Who knows? 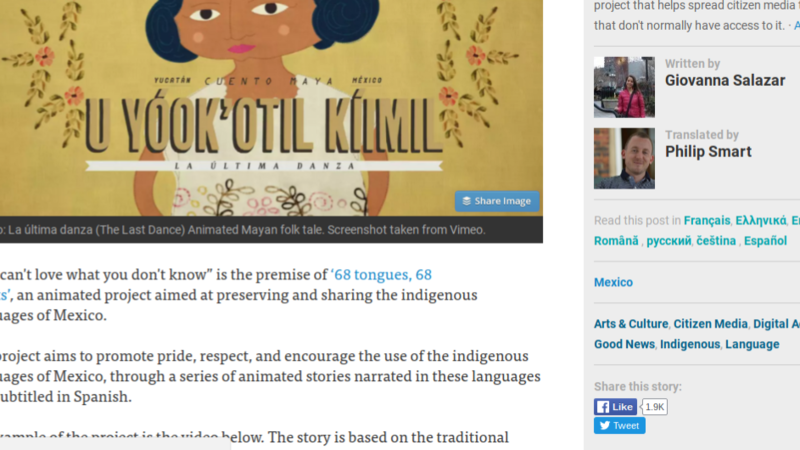 You might just be the spark that makes the next Global Voices story go viral. Nevin, Mohamed Adel, Elizabeth and Asteris manage social media for Global Voices. Have a question? Just ask them! Still feeling beginner when it comes to social media professionals digging in details while everyday shows new tools… thanks for the informative approach. The statistics are always valid and this time, of course, argue your pos. Interesting the value that social media are giving to the stories of GV.